12 boys and girls from Years 1 and 2 took part in Medway’s Tri Golf Festival at Greenacre School on Thursday. Sophie in Year 2 was the only girl in the team that managed to chip the ball over the bench for it in land in the paddling pool, also for extra points in a game called ‘Splashdown’. Bryn in Year 2 amazed us when he hit the ball into the heavens on ‘Drive me up the Wall’, which also contributed high scores. All the children worked very hard, encouraged each other and most importantly had fun! They were a credit to Bryony School and we are over the moon to announce that out of 16 schools, we came first with a whopping 217 points! 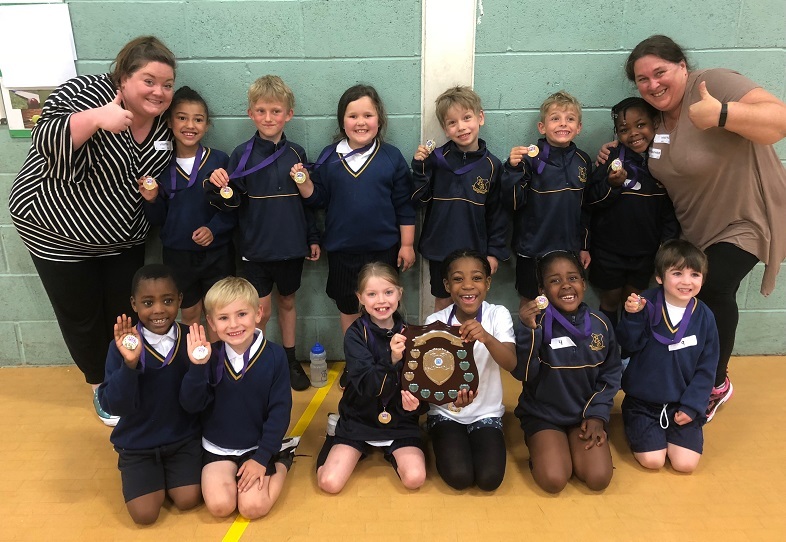 Mrs Dyne and Mrs Oliver were overjoyed (which showed in their reaction to hearing the news) and along with the rest of the school are extremely proud of all the boys and girls that took part. Well done Bryony and thank you Mrs Dyne and Mrs Oliver.